Performers include: Loretta Devine, Ja’net DuBois, Pepe Serna, Michele Morgan, Marc Wilmore, Michael Paul Chan, Shawn Michael Howard, Kevin Michael Richardson, Crystal Scales, Cheryl Francis Harrington, Jenifer Lewis, Eddie Murphy, James Black, Mark Moseley, Cassi Davis, and Phil Morris. A “foamation” series that follows the tenants in an urban housing project in Detroit, Michigan. Curmudgeonly Thurgood Stubbs (Eddie Murphy) is the projects’ superintendent and is married to Muriel (Loretta Devine), the frequent voice of reason. 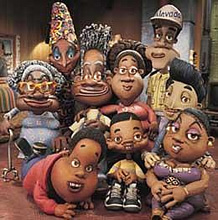 Other colorful characters include senior citizen Mrs. Avery (Ja’net DuBois); young Calvin (Crystal Scales) and “Juicy” Hudson (Michele Morgan) who idolize Thurgood; crackhead Elister “Smokey” (Shawn Michael Howard), Muriel’s sister Bebe (Jenifer Lewis) and her husband Jimmy Ho (Michael Paul Chan); voodoo practicing Mambo “Haiti Lady” Garcel (Cheryl Francis Harrington); Thurgood’s friend Mr. Sanchez (Pepe Serna) who must speak with an electronic voice-box after years of smoking; parole officer Walter Burkett (Marc Wilmore); and the ever-abrupt HUD lady (Cassi Davis) who is only seen in silhouette. Are the pj’s out on dvd ? @john avery: No, it’s not.